Also of interest is another Felix family in Morro Bay's history. "At Morro Creek, in San Luis Obispo County, of old age, on the 3rd day of March, 1872, Filomena Valenzuela, a native of Santa Barbara, died, aged over eighty years. The deceased outlived successively two husbands, by the second having become the mother of Josse Antonio, Jose Ramon, Vincente and Nicolas Feliz, beside others living near the Morro. She has been a resident of San Luis Obispo County for more than twenty years." Also of interest is the following from the source below. "Cayuco is a nautical term applied to a small fishing boat, which is like a canoe and often made of skins. A point on the coast of California that was early used as a port was called by that name because the schooners, pausing offshore from the mouth of a small stream, had commerce with the land by means of these small boats. The creek, the little settlement that grew up near its mouth, and eventually the land nearby were all known by the name. In 1842 Rancho Moro Y Cayucos was granted to Martin Olivera, from Rancho Sausal in Monterey County, and to Vicente Feliz, former mayordomo of another rancho. It was later owned by James McKinley, a Scottish sailor, who married Carmen Amesti, daughter of Jos and #233 Amesti of Rancho Corralitos. McKinley sold it in smaller tracts for dairy farms. History of San Luis Obispo County dtd 1883 states C.H. Phillips purchased Morro y Cayucos in 1875. The town was laid out under his supervision giving Cayucos wide streets. In 1867 this coastal region was served by a weekly stage running from San Luis Obispo to San Simeon. In this year James Cass came to the vicinity of Cayucos Landing and lived first in the hills just back of the settlement, but soon he built a large house that still stands on Ocean Avenue at C Street near Cayucos Creek in the town of Cayucos. Because of his well-directed efforts the settlement began to increase. He built a wharf in 1870 and soon afterward a store and warehouse. 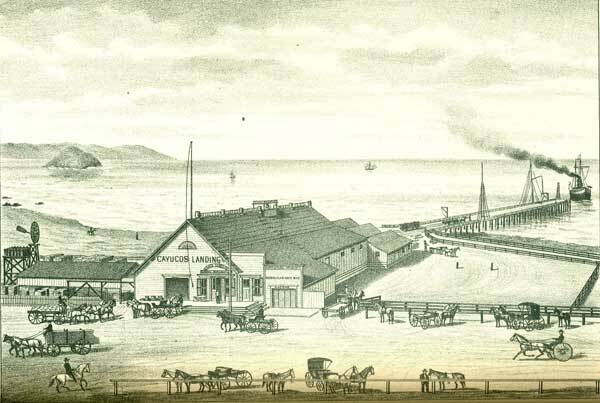 In 1875 the broad streets of the town were laid out, and in the early 1880's a stage bringing passengers from San Miguel and way stations made connections with a weekly boat at Cayucos. For many years considerable shipping was done from here, but finally a storm destroyed a large part of the pier and motor transportation eliminated the need of steamer calls. Only a small pleasure wharf is now on th site of the wharf build by Captain Cass." Rancho San Geronimo Northwest of Cayucos, consisting of two leagues, was granted to Rafael Villavicencio by the Mexican government in 1842. Rafael built a large adobe house 120 feet in length. The ranch was patented in July of 1876. Villa Creek retains the shortened version of Rafael's surname, Villavicencio. Other owners were Ramona Armas, Westley Burnett (b1818 d1905) about 1865, James Blackburn (b1820 d1888) about 1880 and others over the years. See Rafael Villivicencio Family. Historic Spots in California, third edition, by Mildred Brooke Hoover, Hero Eugene Rensch, Ethel Grace Rensch and revised by William N. Abeloe. Stanford University Press. page 383.